I do feel like this is a big statement to make but… I may have found my favourite fake tan. Ever. I say that as I have never finished a fake tan, especially with such commitment. TOWIE tan’s are known to be dark and possibly a little orange but I am pleased to report that you get the dark without the orange if you use Lauren’s Way Self Tanning Bronzing Lotion. I was a little scared at first as I assumed it would be a little orange, when applying it the consistency is much runnier that any other tan I have used. I use a mitt, apply it to the area in long sweeps before buffing it in using circular motions. It’s quick, easy and goes on with no streaks however be sure to use only a little on your hands. 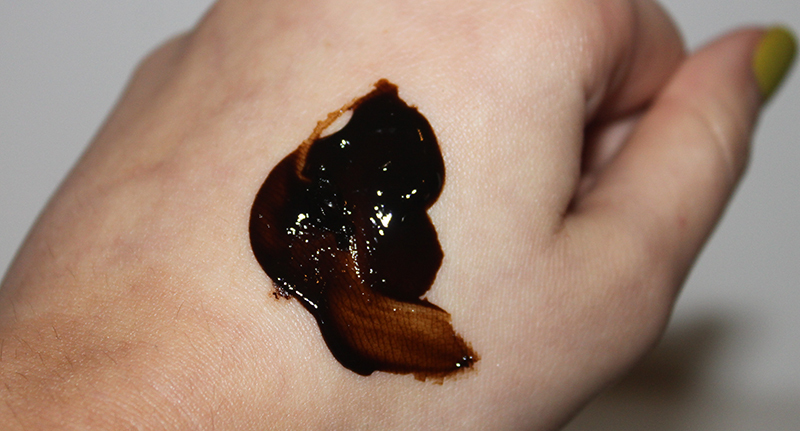 The colour is very dark when you apply it, I mean shockingly dark (see Katie Price, she does have a crazy amount on)! Therefore make sure you apply the tan just before going to bed and wash it off in the morning. It dries quickly so you will be able to put pj’s on soon after but be careful as you may a little colour left on bed sheets (a hot wash will sort it out). The picture above is me with just one layer and having washed it off in the morning, sorry it’s a rubbish photo but you get to see the colour quite well. I don’t have a before picture as I try to stay fake tanned as much as possible but I am very pale, naturally about a Mac NW/NC20 possibly slightly paler in the winter. It has no alcohol or parabens which is always a plus, has a slight fake tan smell in the morning but just be sure to wash it off before leaving the house. It lasts about 5/7 day’s on me but some times I do apply it a few days in a row if I want to be very dark. I’ve used the Medium as well as the Darker Than Dark colours and I wouldn’t say there is that much between them, this tan isn’t for you if you want just a light glow. As always keep it well moisturised and exfoliate prior to application. At under £16 I think it is quite a reasonable prize which should last about 3 months, even with regular application. Would you like a post with all my fake tanning tips? What is your favourite fake tan? I think the colour looks lovely! I love this tan! I always get this when I get a spray tan, it washes off so nicely as well! I didn't even know you could get it as a spray tan, may have to look for somewhere that does it! You have really opened my eyes, I LOVE tanning products, but like you I was a bit worried it would be quite orange, but it looks really lovely on you! Definitely convinced me to try it, such a reasonable price too! I'm scared of using fake tan, as im so pale, so i dont know if such a dark colour would be for me! You look gorgeous though. Always wondered if this was any good 🙂 I want to give it a try now! Wow, super dark! And a really good price. I have to be honest, I know I should not judge but I was never a fan of Lauren on TOWIE and therefore I resented giving her money …but after all the rave reviews about this tan I caved in. I'm glad I did as it's probably the best I've used! Love the look of this, the tan looks lovely on you! Always been intrigued with this tan and I have tot say it looks fab ! I haven't tried the glam tan either, let me know!